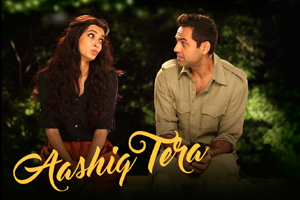 A happy song sung by Altamash Faridi featuring Abhay Deol, Diana Penty, Ali Fazal, Momal Sheikh. Star Cast: Abhay Deol, Diana Penty, Ali Fazal, Jimmy Sheirgill, Momal Sheikh. The video of this song is available on YouTube at the official channel Eros Now. This video is of 2 minutes 27 seconds duration. Lyrics in Hindi (Unicode) of "आशिक तेरा"